New research study “Passive Electronic Components: World Market Outlook: 2012-2017” prepared by Paumanok Publications has been recently published by Market Publishers Ltd. The study reports that the increasing adoption and transition toward 3G/4G technologies and increasing bandwidth in Internet communication have stirred the need for electronic devices, thereby leading to the growth of electronic components. Electronic components are the backbone of industries such as computers, telecommunications, consumer electronics, and many others. They are also increasingly used in industries such as automotive, medical electronics, aerospace, and defense. Growth in electronic components would be characterized by the development of technologies and innovations in the electronic industry. Each sector is driven by a key trend that stimulates the growth of that industry. The demand in the telecommunications industry is characterized by the expansion of the communications network across the world. The increasing adoption and transition toward 3G/4G technologies and increasing bandwidth in Internet communication have stirred the need for electronic devices, thereby leading to the growth of electronic components. 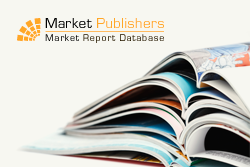 New research study “Passive Electronic Components: World Market Outlook: 2012-2017” prepared by Paumanok Publications has been recently published by Market Publishers Ltd. The study delves into in-depth research and detailed analysis of the world passive electronic components industry. It makes future price, value and volume forecasts for each passive component as well as a historical record of demand cycles from 1993-2012 and forecasts from 2013 to 2017. A current analysis of each end-use market segment is used to make tactical forecasts for FY 2012 and long term forecasts about each of the key passive electronic component product lines to 2017. Furthermore, elaborate profiles of all key vendors of passive components are also included. More new reports by the publisher can be found at Paumanok Publications page.